Extreme-ultraviolet (EUV) waves are spectacular horizontally propagating disturbances in the low solar corona. If an EUV wave encounters an ambient coronal structure it may trigger another horizontal wave, which is always named a ‘secondary wave’ (SW). We present the first example of upward SWs in a streamer-like structure, a bright loop-like structure developing over an active region, after the passing of an EUV wave. The EUV wave was associated with a coronal mass ejection (CME) and a type II radio burst that represented the existence of a coronal shock. Intriguingly, upward SWs rose slowly in the streamer-like structure after the sweeping of the EUV wave. We suggest that part of the EUV wave was probably trapped in the closed magnetic fields of the streamer-like structure, and upward SWs possibly resulted from the release of slow-mode trapped waves. It is believed that the interplay of the strong compression of the coronal shock and the configuration of the streamer-like structure is crucial for the formation of upward SWs. The EUV wave occurred in NOAA AR 12661 on 2017 June 1. In the composite images (Fig.1(a)-(b)) of Large Angle and Spectrometric Coronagraph (LASCO) C2 and Atmospheric Imaging Assembly (AIA) 193 Å, AR 12661 is situated near the north leg of a bright steamer belt, and the streamer-like structure on the north connected with the overlying streamer chains (Fig.1(a)). Due to the perturbation of the CME, the streamer chains became very bright (Fig.1(b)). In the light curve of cusp region in 94 Å of the flare region, the flare impulsive phase started at ~01:39 UT, and peaked at ~01:51 UT (dotted vertical lines in Fig.1(c)). The radio spectrum of Yunnan Astronomical Observatories (YNAO) and Learmonth (LEAR) shows well the related type II radio burst that indicates the formation of a coronal shock, and two strong stripes are correspond to the fundamental (F) and harmonic (H) branches (Fig.1(d)). The burst was initiated at ~01:43:30 UT, and F and H branches almost disappeared at ~01:45 and ~01:48 UT, respectively. Assuming an initial shock speed of 1500 km/s, we calculated the fitting curves of F and H branches by using the one-fold (red solid), three-fold (red dashed), and five-fold (red dotted) Newkirk coronal density models, respectively. It is obvious that the curves of the one-fold Newkirk model fit best with the radio burst. On the other hand, the deduced start height (1.18 Rsun) for the one-fold Newkirk model is also consistent with that of the CME front at the same time. Furthermore, ~2 minutes after the disappearance of the H branch, another type II radio burst appeared at ~90 MHz, and slowly drifted to ~60 MHz till ~01:55 UT (the yellow box in Fig.1(d)). 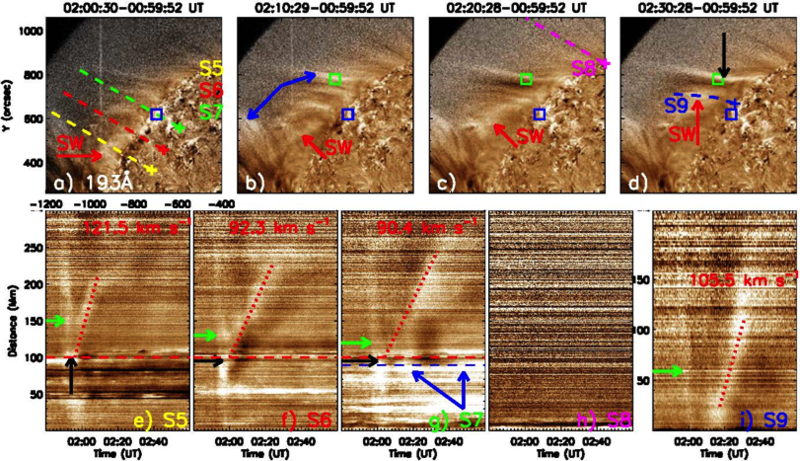 It is likely a result of an interaction between the coronal shock and the streamer(-like) structure (Feng et al. 2013; Kong et al. 2012). Figure 1. ((a)-(b)) The CME emanating below the streamer belt and the disturbance in streamer chains. (c) The intensity curve of AIA 94 Å. (d) Composition radio dynamic spectrum obtained by LEAR (25-180 MHz) and YNAO (180-350 MHz). Intriguingly, upward SWs rose after the EUV wave passed through the streamer-like structure (Figure 2). The SWs (red arrows in Fig.2(a)-(c)) slowly ascended in sequence from south to north in the streamer-like structure (blue arrows in Fig.2(b)). Furthermore, another upward SW clearly propagated along the loops close to the north boundary of the streamer-like structure (the red arrow in Fig.2(d)). 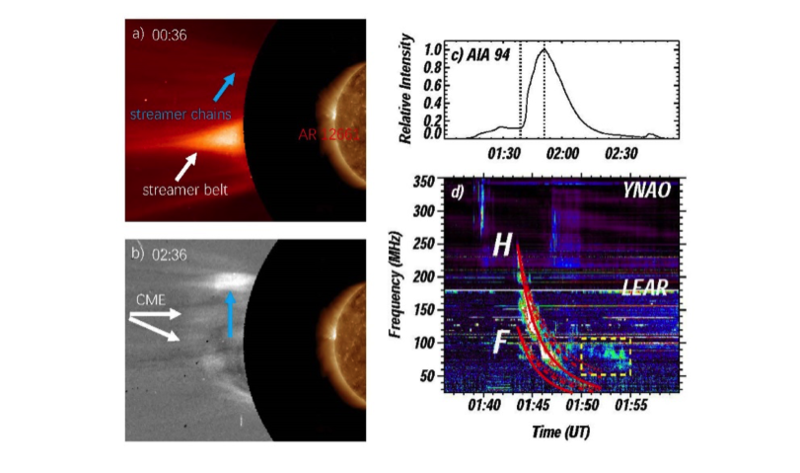 The coronal loops at the north boundary of the streamer-like structure became bright (the black arrow in Fig.2(d)). The kinematics of upward SWs are analyzed in time-space plots (Fig.2(e)-(g) and (i)) along some slices in the streamer-like structure (S5-S7, and S9; Fig.2(a) and (d)). The SWs propagated at speeds of ~90-120 km/s, indicated by red dotted lines in Fig.2(e)-(g) and (i). The onsets of SWs are closely associated with the arrival of the EUV wave (green arrows in Fig.2(e)-(g) and (i)). The SWs are traced back to limb brightenings (black arrows in Fig.2(e)-(g)). The limb brightenings were triggered by the EUV wave and quickly disappeared with the release of upward SWs. In addition, there was no signal of upward SWs along the slice (S8; the pink dashed line in Fig.2(c) starting from the interior of the CH beyond the north end of the streamer-like structure (Fig.2(h)). Figure 2. ((a)-(f)) The EUV wave (green arrows) and the associated lightened loops (red arrows). ((g)-(i)) Time-space plots of the wave propagation and brightenings. In this EUV wave event, the interaction between the EUV wave and a streamer-like structure triggered some upward SWs, and the interaction is also confirmed by the sudden change of the radio spectrum (the yellow box in Fig.1(d)). It is suggested that the fast-mode MHD wave can be partly trapped inside magnetic loops rooting at magnetic quasi-separatrix layers (Chen et al. 2016; Zong and Dai 2017). The lower start position (1.18 Rsun) of the shock can release trapped waves in the lower corona, and the speed (~80 km/s) of upward SWs is in the speed range of slow-mode waves. Hence, we propose that the upward SWs likely originated from the partially trapped fast-mode EUV wave, and were possibly activated by the strong compression of the shock wave in the form of slow-mode.